As the first temple of the Restoration (and the only one completed in the lifetime of founder Joseph Smith Jr.), Kirtland Temple holds a special position for everyone in the Latter Day Saint movement. Although owned by Community of Christ, the temple is a pilgrimage destination open to members of all the different churches and every one else interested in history and historic sacred spaces. The majority of visitors to Kirtland are members of the LDS Church (who make up an overwhelming numerical majority in the overall movement), but many of these visitors find that Kirtland Temple doesn’t match their expectations of what a Mormon temple ought to be. Where are the rooms for sealings and endowments? Did the Community of Christ folks remove the baptismal font? 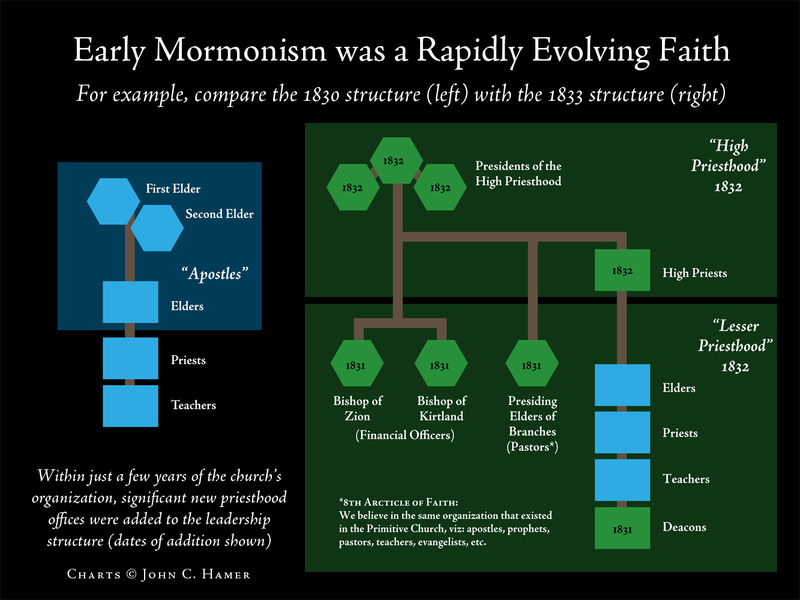 As I noted with the evolution of priesthood ideas and offices in the early church period, early Mormonism was a rapidly evolving movement. Latter Day Saint ideas of temples changed significantly between the Kirtland and Nauvoo periods and the LDS Church and Community of Christ have retained and emphasized different parts of the shared heritage. I think this idea can be illustrated in admittedly simplified form with the diagrams attached to this post. Kirtland Temple was built in response to revelation and dedicated as a “house of prayer,” “a house of learning,” and “a house of order” (Community of Christ D&C 85, LDS D&C 88). Although everything was more complex in practice, in concept the temple’s three levels were set aside for these purposes. Assembly worship in large congregations were held in the inner court on the main floor. The upper court of the second floor was set aside for education, for example training of missionaries called to spread the gospel. Finally, the attic level functioned as church headquarters with offices for church leaders. 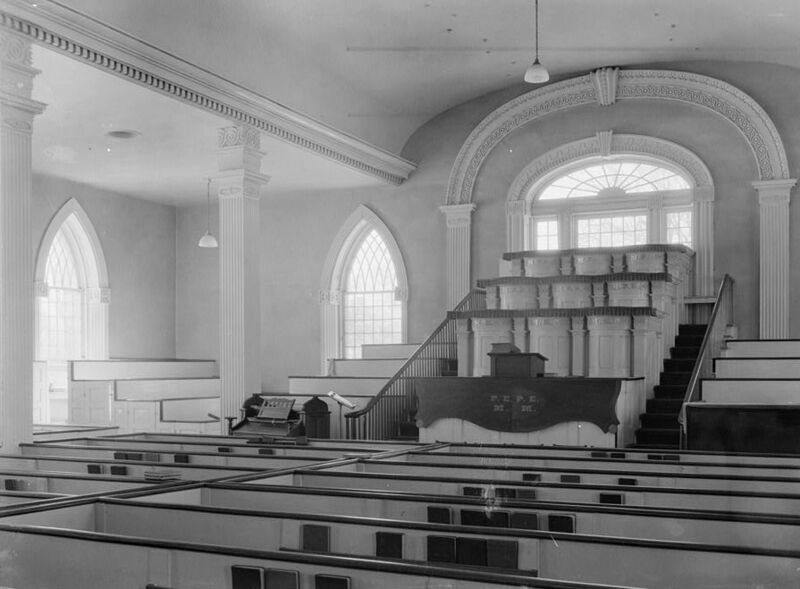 The same interior layout of Kirtland Temple with one court above the other (taking up the lion’s share of space) was replicated in the original Nauvoo Temple*, but because of the temple’s increased scale, headquarters offices were able to be moved to a mezzanine level between the two courts. However, Nauvoo included new spaces and new functions that did not exist at the time Kirtland temple was built. A font was included in the basement for the performance of baptisms for the dead and the attic floor had rooms for the endowment and sealing ceremonies. When Brigham Young’s followers built the four pioneer temples in Utah, Nauvoo was their clear model. The assembly hall was retained but the secondary hall for education was left out of the plan. As the Nauvoo-era ordinances became the critical temple function in the Utah church more space was devoted to these practices. (Although the LDS Church has a separate headquarters building from the Salt Lake City Temple, church leaders have special rooms within the temple, which I’ve indicated with the diagram.) 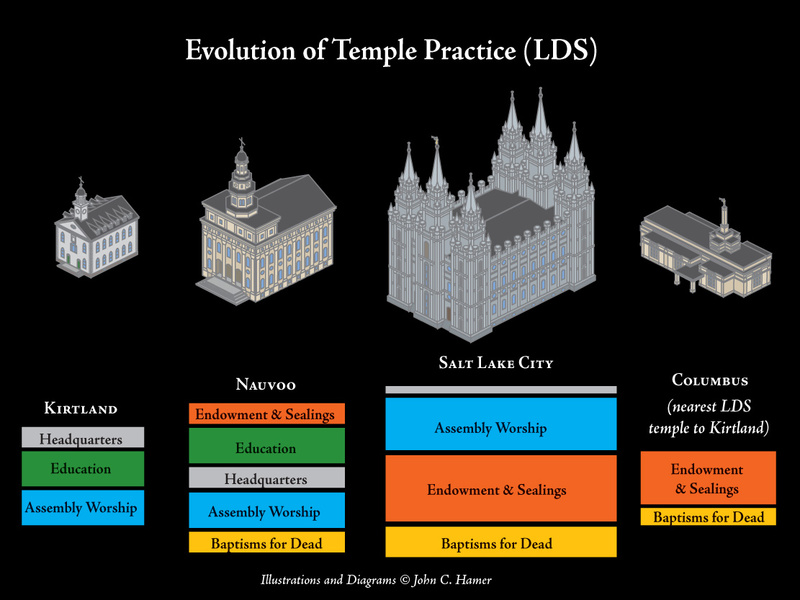 With a few exceptions (like the Washington DC Temple), subsequent Mormon temples are devoted exclusively to Nauvo0-era ordinances. For this reason, Mormons in Ohio familiar with (for example) the Columbus Ohio Temple will find little in Kirtland to meet their expectations. 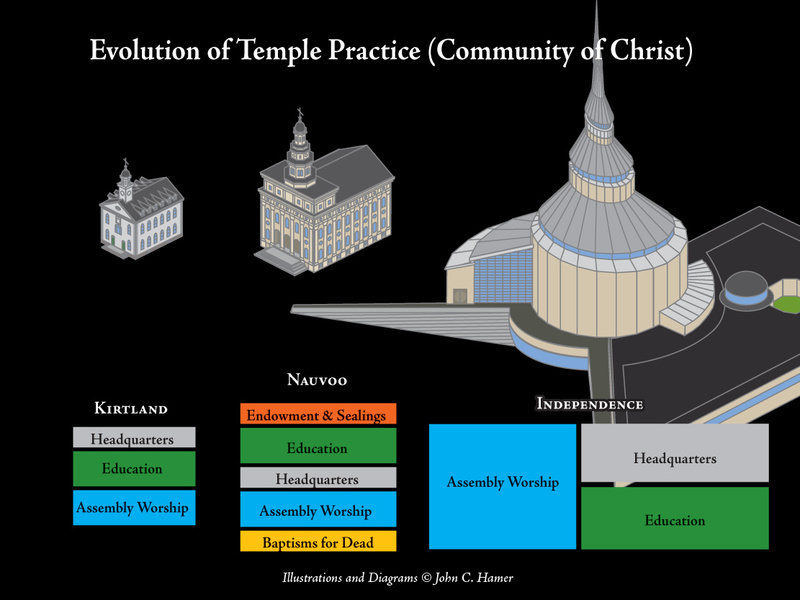 Community of Christ, by contrast, has emphasized the other aspects of the temple experience of the early church. The Temple in Independence ignores Nauvoo developments and takes Kirtland as its direct model, setting aside an inner court for special public assembly worship, and space for education (library/archives, temple school, conferences, training) and space for the offices of church headquarters. Beyond the Kirtland precedent, in response to 20th century revelation, the Independence Temple has the added function of being dedicated to peace and the promotion of peace and justice. As with so many things, both churches are drawing from the same shared heritage, even if the end results today look very different. * The new Nauvoo Illinois Temple dedicated by the LDS Church in 2002 does not replicate the original structure’s interior. The original temple’s upper court was omitted and the lower court assembly hall is smaller than the original. You can find the roots for much of the rich diversity in the Latter Day Saint movement today in the experience of the early church period (late 1820s–1844). Early believers, like Martin Harris, Oliver Cowdery, the Whitmer family, along with Emma Smith and Joseph Smith’s siblings and parents, had a very different initial encounter with the faith than those who joined after the publication of the Book of Mormon and the organization of the Church of Christ. The church these first members later experienced in Kirtland and Missouri had evolved rapidly. By 1835, the renamed “Church of the Latter Day Saints” looked radically different than the “Church of Christ” they had known in 1830. These charts of priesthood offices are just one example of that change. Structural changes continued after the collapse of the church in Kirtland (1837–38) and during the events of the Missouri-Mormon war and its aftermath (1838–39). In Nauvoo, Joseph Smith would go on to construct a kind of inner (secret) church within the church, by creating new groups such as the Anointed Quorum, and restoring the Kingdom (as separate from the priesthood and the church) and its living constitution, the Council of Fifty. It is little wonder that the movement was continually throwing off members who had signed up for earlier incarnations of the faith. David Whitmer, for example, could accurately make the argument that the church had left him (and not vice versa). 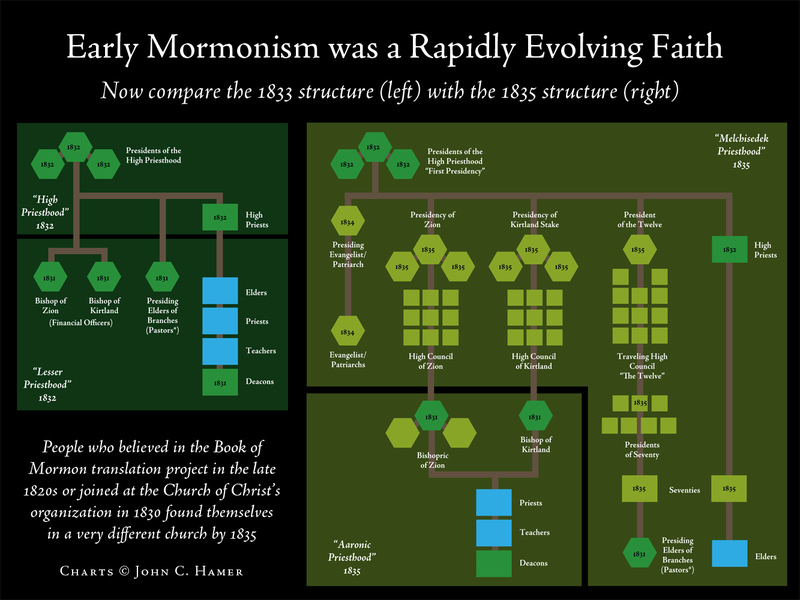 As different Latter Day Saint tradition churches have looked back to the early period, they have found a rich grab-bag of ideas and precedents. No group can embrace them all; instead, each church has taken the part of the original experience that it finds most meaningful to its own experience. Christmas weekend, a commercial invitation for Community of Christ will be airing on local TV stations in the greater Kansas City area. 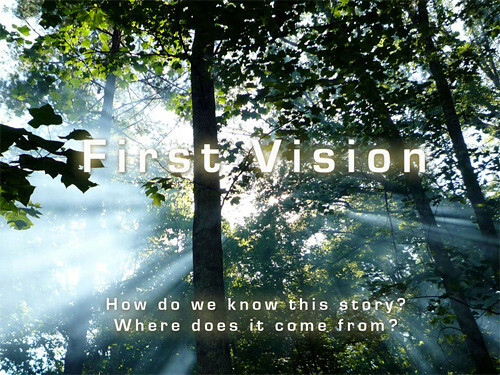 It is being aired by three mission centers: Central Mission, Midlands Mission Center, and Far West. In a variety of previous posts I have reflected on the implications of the Community of Christ’s decline in its traditional geographic ‘core’ of the American Midwest, and growth in the ‘periphery’ of Latin America, Africa and Asia. I have also reflect on the ways people express discontent in the church, using the economic model of “Exit, Voice and Loyalty.” However, I haven’t really had any meaty data to work with. This week I had a rushed visit to the Community of Christ archives for a couple hours and tried to get a little more hard data. It is necessarily inadequate because I didn’t have a lot of time. Nonetheless I think it tells an interesting story of the way “Voice” is changing in the denomination. There is a slow, but definite trend, of World Conference becoming a venue of increasingly diverse voices, while the USA and Canada remain dominant. 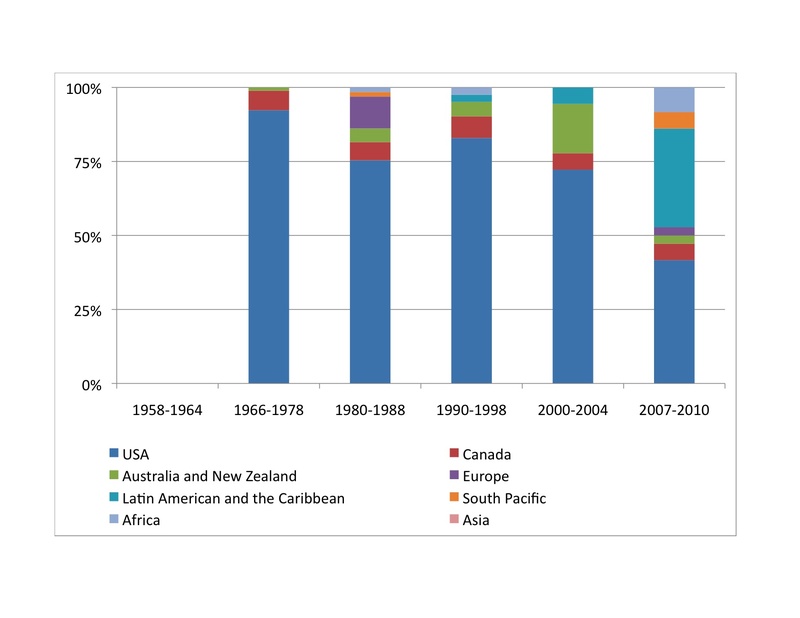 I went through all the Bulletins for every World Conference since 1958, when the church expressed its desire to become a “world church”, and counted how many World Conference Resolutions proposed by field jurisdictions were from each area of the world. I did not count the resolutions that came from the headquarters leadership. A less rushed scholar would have looked at how many of these resolutions had ‘policy success’ by actually being passed by the chamber and avoiding amendments — maybe one of you Saints Herald readers can take up that challenge! (See the asterix at the bottom for some methodological notes).